The Abingdon-Church of the Resurrection Ministry Guides are the first choice for recruiting, motivating, and developing lay leadership for specialized ministries from A to Z?from adult ministries to ushering. Each inexpensive, 64-page Guide brings together Church of the Resurrection's can-do attitude with Abingdon Press's ministry of empowering church leaders. The result is a series that is user-friendly, encouraging, and most important, practical. The passion to help churches experience how many things they can do to encourage participation drives these Ministry Guides. Each Guide is concise, conversational, and current, full of ideas you'll be able to implement immediately, with little or no budget. Recognizing that volunteers are busy people who work hard, the Guides will be the first place to turn when you're new to a topic, to help you feel empowered, prepare quickly, and get up and running with confidence and creativity. You'll find eye-catching icons and features that help you move directly to practical, fun, and effective solutions. Judy Comstock is the Director of Children's Ministries at the United Methodist Church of the Resurrection. Judy Comstock is the Director of Children?? ?s Ministries at the United Methodist Church of the Resurrection. The Abingdon-Church of the Resurrection Ministry Guides are the first choice for recruiting, motivating, and developing lay leadership for specialized ministries from A to Z?? ?from adult ministries to ushering. Each inexpensive, 64-page Guide brings together Church of the Resurrection?? ?s can-do attitude with Abingdon Press?? ?s ministry of empowering church leaders. The result is a series that is user-friendly, encouraging, and most important, practical. The passion to help churches experience how many things they can do to encourage participation drives these Ministry Guides. Each Guide is concise, conversational, and current, full of ideas you?? ?ll be able to implement immediately, with little or no budget. Recognizing that volunteers are busy people who work hard, the Guides will be the first place to turn when you?? ?re new to a topic, to help you feel empowered, prepare quickly, and get up and running with confidence and creativity. You?? ?ll find eye-catching icons and features that help you move directly to practical, fun, and effective solutions. 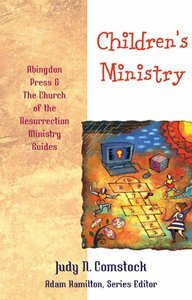 The Abingdon Press/The Church of the Resurrection Ministry Guides are the first choice for recruiting, motivating, and developing lay leadership for specialized ministries from A to Z. Each guide is user-friendly, encouraging, and most important, full of ideas that can be implemented immediately, with little or no budget. Recognizing that volunteers are busy people who work hard, this Guide to Children?? ?s Ministry will be the first place to turn to help children?? ?s workers feel empowered, prepare quickly, and get up and running with confidence and creativity. The Guide employs eye-catching icons and features that help the reader move directly to practical, fun, and effective solutions.